As a tennis aficionado, I was following attentively the career of both these accomplished men, but especially Goran Ivanisevic. At this epic Wimbledon final, Goran was 30 years old. Once ranked second in the world, he had three Wimbledon finals under his belt, but all lost. After his last defeat against Pete Sampras, he refused to talk to anyone for the following six months. He had more than 20 trophies to show his impressive pedigree, but no Grand Slam title to fulfill his life-long dream. 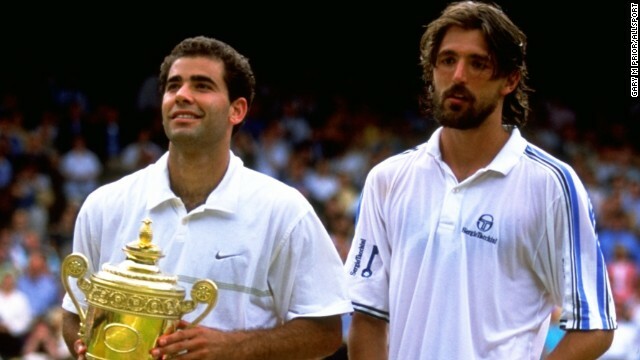 Goran Ivanisevic dejected after the lost to Sampras at the 1998 Wimbledon Men’s Finals. By the summer of 2001, Ivanišević was ranked the World No. 125. This was not sufficient to earn him an automatic place in the main draw at Wimbledon but, given his past record as a three-time runner-up, he was awarded a wildcard for entry into the singles draw. He defeated former and future World #1 players Carlos Moyá, Andy Roddick and Marat Safin to reach the semi-final, beating home favourite Tim Henman in a five set, rain-affected semi-final, setting-up a match with the previous year’s runner-up and former US Open champion Patrick Rafter. The next video is the last 8 minutes of Ivanisevic playing Patrick Rafter in an epic five-set match at 2001 Wimbledon Men’s Final. Get ready to be drawn into this emotional and dramatic final 8 minutes of the match. This is one of the most dramatic matches in tennis history, showcasing desire and emotion like never before seen on the tennis court. Twelve points are played, but no more than 7 strokes are exchanged. Ivanisevic serves with over 200km/h both the first and the second serve, becoming the only player in tennis history to miss two match points with double faults. He clings to anything, praying, looking for lucky balls. He starts crying at 40-30, but he needs three more Championship Points to finally be able to tumble on his beloved Wimbledon grass. So what is the litmus test that distinguishes a champion from a wanna-be champion? The answer shows it is mental toughness. 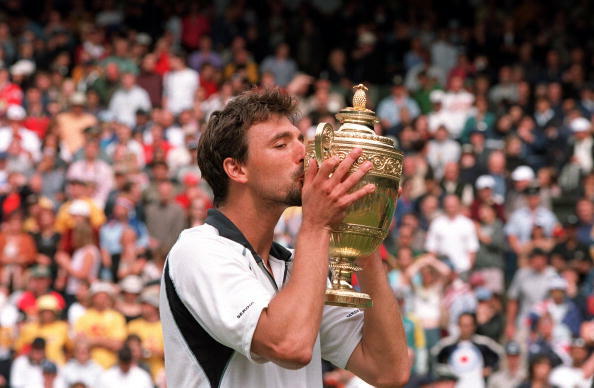 Despite the enormous pressure Ivanisevic faced, he persisted relentlessly culminating into fulfilling his life-long dream of winning the most Wimbledon tournament. His mental toughness at the end prevailed, enabling him to win. We don’t need to undergo Hell Week to become mentally tough. John Ryan, President of Center for Creative Leadership, shares three concrete steps you could take to increase your mental toughness. First, read biographies. They will elevate your perspective in many ways. It’s easy to look at successful people from Abraham Lincoln to Eleanor Roosevelt to Steve Jobs and assume everything came easily to them. But when you study their lives, you see not only that they had to grapple with hard times but also that those very experiences gave them the mental resources and habits they needed to lead at a high level. Lincoln was raised in a poor family and had to educate himself. Roosevelt battled blatant sexism. And Jobs was forced out of the company he founded. Each of these leaders demonstrated an ability to withstand adversity and to move forward in the face of frustration. Be sure to read one good biography this summer. Second, build a strong support community. Lincoln, Roosevelt and Jobs didn’t succeed entirely on their own. At crucial junctures, there were family, friends, teachers and colleagues who offered the encouragement, wisdom and resources to keep going, whose shoulders they stood on as they climbed to the top. It takes resilience and composure to manage the full range of negative emotions that often surface when facing difficult challenges. Have you surrounded yourself with a support team? And, just as importantly, on whose support team are you serving? Third, look for and accept challenges. Research about learning agility that the Center for Creative Leadership conducted with Columbia University reveals the great value of intentionally putting ourselves in challenging circumstances and staying open to learning in these situations without becoming defensive. I’m a firm believer that we always need to be tackling a substantive challenge in some area of our lives, whether it’s pursuing a new professional experience, making a positive change in our family life, adopting a new fitness regimen, expanding our spiritual lives or cultivating a new hobby. These new challenges will give us the opportunity to practice being flexible in our approach and to look for new ways to reach our goal. Question: Do you follow tennis or other sports? What other aspects of mental toughness have you noticed in sports players who have become champions?